Today, during a ceremony under the patronage of His Highness Sheikh Hamdan Bin Mohammed Bin Rashid Al Maktoum, Crown Prince of Dubai and Chairman of Dubai Executive Council at the Dubai World Trade Center; we were ranked 16th of the Top SME 100. 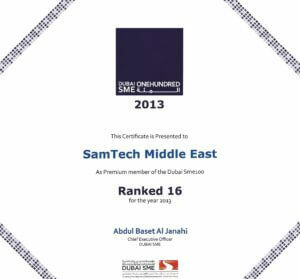 We are glad that our efforts and hard work have kept us among the Top 20 of the ranking. In fact, we have moved from 18th in 2011 to 16th this year. We hope to be among the Top 10 by 2015. The legend in the picture below shows our ranking as following: 39 in International Orientation, 23 for growth performance, 51 for human capital development, 64 for corporate governance and 14 for innovation.